Your Car Recommendation For Broke, Flakazoid, Car-Ignorant Friends? Here's a situation I'm sure a goodly portion of the Jalopnik readership has experienced. You have a friend who has a bunch of redeeming qualities but couldn't pour piss from a boot, much less scrape up the green to buy a decent car or spin a wrench to maintain a shaky one, and of course this friend calls you (the Guy Who Knows Car Stuff) with a question: "Hey, I got $1300 from a [tax refund / insurance settlement / dead relative / dope deal] and now I wanna get a car! Whaddya think I should get?" 1. 2nd-gen Nissan Sentra. You can get a running '87-90 Sentra for peanuts, they're well-made and reliable, they usually pass CA smog, they're not big blowers of head gaskets, and they have a timing chain instead of a belt. Plus they're fairly speedy, though they handle like crap and ride like oxcarts. 2. 3rd-gen Toyota Tercel. You can get an ugly '87-90 Tercel pretty cheap (but priced higher than a Sentra because Everyone Knows Toyotas Are Good), they've got that bulletproof Toyota quality, and they're dull but not unpleasant drivers. They've got timing belts, but the noninterference engine means your flaky friend won't die after the 150,000-mile timing belt snaps. 3. 3rd-gen Honda Civic. 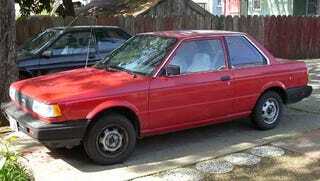 By far the quickest and most fun to drive of the three, the '84-87 Civic is reliable but has some weaknesses. First, it's hard as hell to get a non-Si model to pass CA smog. Second, your flaky friend will fail to check the coolant, overheat, and thus blow the fragile head gasket. Third, your flaky friend will fail to replace the old timing belt and it will snap, bombing the interference engine and locking up the wheels on the highway. Fourth, a CV joint will fail after your flaky friend cranks up the stereo to avoid hearing that increasingly nasty clackety-clack sound for month after month, stranding him or her on a desolate goat trail in the Mojave in August with no provisions save a can of Clamato. So, that's my own personal curmudgeonly advice. How about you, dear readers? Remember, the flakazoid friend won't have any money for maintenance and can't fix anything, and they'll probably try to hit you up for free repair help on anything that breaks. What do you say? Question of the Day: Worst Car Hack You&apos;ve Ever Seen?